Source: Budget-Friendly Fresh and Local Diabetes Cookbook. Recipe Credit: Charles Mattocks. Photo Credit: Renee Comet. This light, delicious seafood dish may look fancy, but it's an easy and budget-friendly option for a lower carb main dish that's designed specifically for those with diabetes. Pair with a side salad and you have a restaurant quality weeknight dinner at a fraction of the cost. This recipe is from the Budget-Friendly Fresh and Local Diabetes Cookbook, by Charles Mattocks. To order this title and other great ADA cookbooks, please click here. Prep a baking dish with nonstick cooking spray. Heat the olive oil in a heavy skillet and add onions, garlic, and bell pepper, cooking until the onion is soft. Add the anchovies, olives, fennel seed, and black pepper. Stir to combine. Place 4 pieces of the cod in a single layer in the baking dish. Spread evenly with the anchovy/olive mixture. 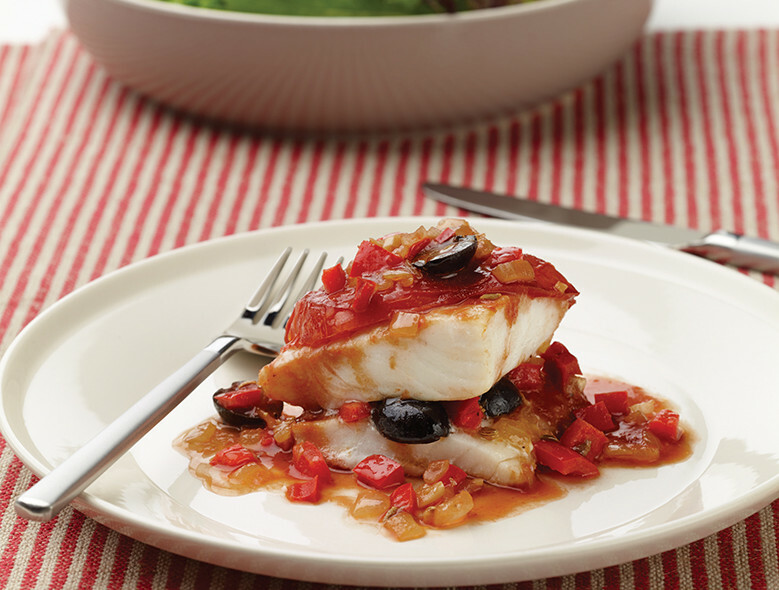 Top each piece with another piece, making a cod “sandwich.” Top each with a slice of tomato. Combine the diluted tomato paste with the red wine and pour over the fish. Bake for 20 minutes until the fish is flaky, basting every 5 minutes or so. Most of the cod fillets I see are pretty darn large. It would be helpful to include weight guidance for the fish.